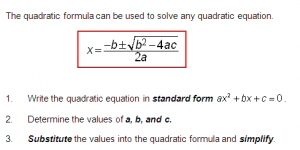 This week in pre calculus 11 we learned how to solve quadratic equations, which at first the concept was a bit confusing but after working in the workbook started to get much easier because I was starting to see the patterns of the equations and expressions. 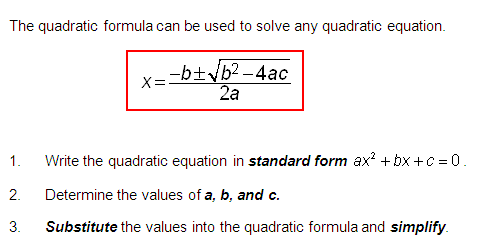 Today we actually learned the third way of solving a quadratic equations and with this way it uses a quadratic formula (in image above) and you can take the a,b, and c out of our equations that equal 0. For me it wasn’t to hard to start to understand where you would be inputting these numbers and started putting them in the right spots without even realizing, for me the hardest part was remembering the formula to use. I learned that it’s better to take the time to look over your steps and do them slower so you avoid mistakes instead of rushing through them and messing up because it is very hard to verify them.